Teresa Kasner: Dollhouse Family and Happy New Year! The little girl is practicing the piano - "Fur Elise" is what she's playing. Her name? Amber? Lillian? Help! Mom and Dad are enjoying the day - he's reading a book on learning French and they are practicing. Mom's name... Victoria? Dad.. Albert? LOL! Little guy's favorite toys are the red tractor and the toy train. I put the granny square throw on the bed. There is a rose in a tiny vase that my friend Shirley gave me from her miniature collection - also the inkwell and some candles. Thank you, Shirley! Standing back and showing all the rooms. Yesterday we took a drive to Bridgeport Village to the Crate and Barrel store to pick up 2 baking pans made by Dansk. I was not happy with the big aluminum pans on my well-laid table so I wanted some prettier baking pans that would go to the table and look nice. I'd seen these neat bakers on the Food Network shows with these cool handles, but had no idea what kind they were. I did quite a bit of looking on the internet until FINALLY I saw these and the brand name. They are really neat - steel covered with enamel. The good part is that they aren't as heavy as cast iron enamel. Today we're going to test them out with oven baked barbecue boneless pork ribs and in the other pan, home made scalloped potatoes. I will show you that in my next post and give you this great recipe for the ribs that my sister Roberta found. Do you like these pans? On our way back from Bridgeport we were on I-205 and near Oregon City I saw the Alpen Glow on Mt. Hood and veered off the freeway to a viewpoint.. 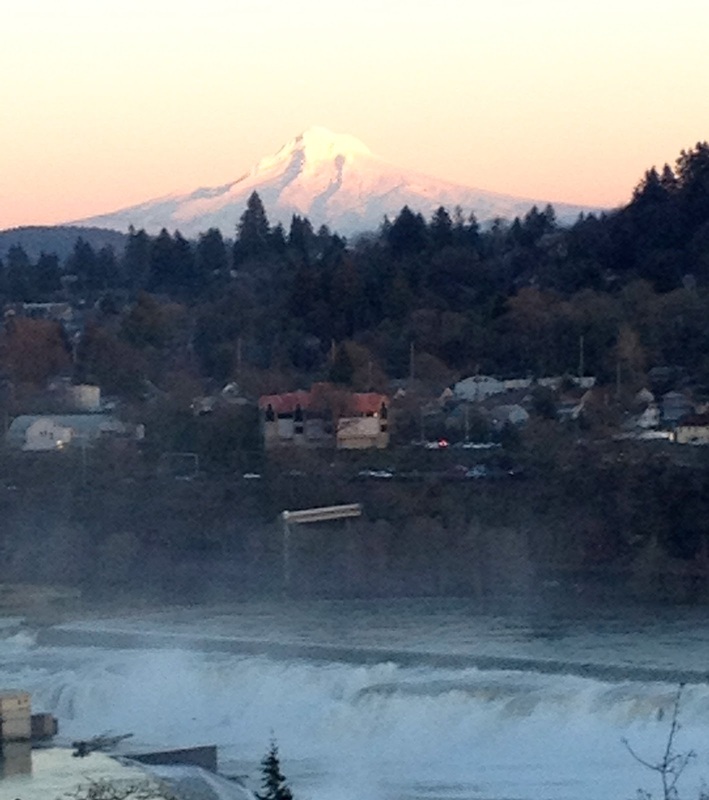 I hopped out of the car with my iPhone and was cursing myself for not bringing my Lumix camera.. and got this shot of the pink mountain behind Willamette Falls. Nanny/Shona, Little Girl/Fiona, Little Boy/Angus, Mum and Dad/Clare and John! Have a very nice New Year's Eve--your BBQ ribs sound yummy! Happy new year to you, Teresa! :) We had a great celebration with our friends! Definitely Betsy for the nanny! Lol. I just love the dollhouse anf I think Victoria and Albert are great names too. I love the pans-a great improvement over the others but when there is love around the table it really doesn't matter what the food is on or in as long as you're together. I love yor picture of Mt. Hood. Both you and Gracie got some beauties. I made 12 of your ornaments last night and posted a picture on my blog this morning. You'll have to take a look. Teresa, the dollhouse looks beautiful, Vivian and James for the kids, Vitoria and Albert sounds perfect for the adults, and the nanny is Letitia of course after me! Meredith Letitia! I hope that family isn't too loud and rowdie for the New Year. Hugs to you and Dayle and Happy New Year. Your dolls house looks so cute! Happy new year Teresa and your whole family. Love your doll house Teresa. Nanny Betsy and Baby Beth. That was fun to name a family!!! What an adorable dollhouse family! They all look completely at home in their new surroundings. Grace was SO happy to accomodate your request for tiny treats; I'm going to add a few little surprises for the Victorian nursery too. I am so happy you found a family to live in the house!!! They are perfect!! I love the pans. It is nice to have some that can go from oven to table!! Happy New Year Teresa! I am so blessed to call you friend. The new pans look pretty and practical and Mt. Hood amazing! We are about ready for some sparking apple juice over on our side of town at midnight. We had a bit of snow this morning, did you? Happy New Year, Teresa and thank you for your wonderful blog. Very best wishes for 2013 to you and your family. Now you know I am such a sucker for these dollhouse posts. I just wish my life wasn't so hectic so I could get busy and work on mine. I love that your little family paid the electric bill and now the little house is lit up,lol. They look so perfect in their new surroundings and I think the names you picked are just right for them. I love Victoria and Albert. I think if you wanted names for the little girl and the baby that you should name them after your little granddaughters who live right here in Ohio, and of course you could name the little boy after your grandsons, combine their names into one. I haven't seen pans like that, but how nice that they have those handles to make it easier to get from the oven. The photo you got of Mt. Hood looks like a postcard, you could have it made into a puzzle. I am like you, I think I could use some weight loss for the new year. Why does all the good tasting food have to be so bad for ya????? Happy New Year to you, your hubby and family! What a sweet little dollhouse family! I love the picture of Mt. Hood - I get so homesick sometimes for Oregon! I love your new doll house family....such lovely pictures of them all busy in there too :) Loved the alpenglow as well. Wishing you and your family a very Happy New Year! Happy New Year to you and your family Teresa!...I hope you have a wonderful 2013...Your doll house is wonderful...We have a nanny in ours too (which I really must show you some time) although we don't have any other people!...I bought her from a little shop in Covent Garden several years ago...Beautiful pics as always and I'm so looking forward to visiting you once again through this new year! I love your new family! They are all so sweet! I think you should name them all after yourselves for you all are such the sweetest family ever! Thanks so much for all the visits and comments that you have made on my blog....you never miss one, which is so special to me...a true friend! Looking forward to another great year with you and your family! Your little family is precious! I have to admit that I don't make resolutions...then I can't disappoint myself ;) Happy New Year!!!! Love the shot of Mt. Hood and the OC falls.